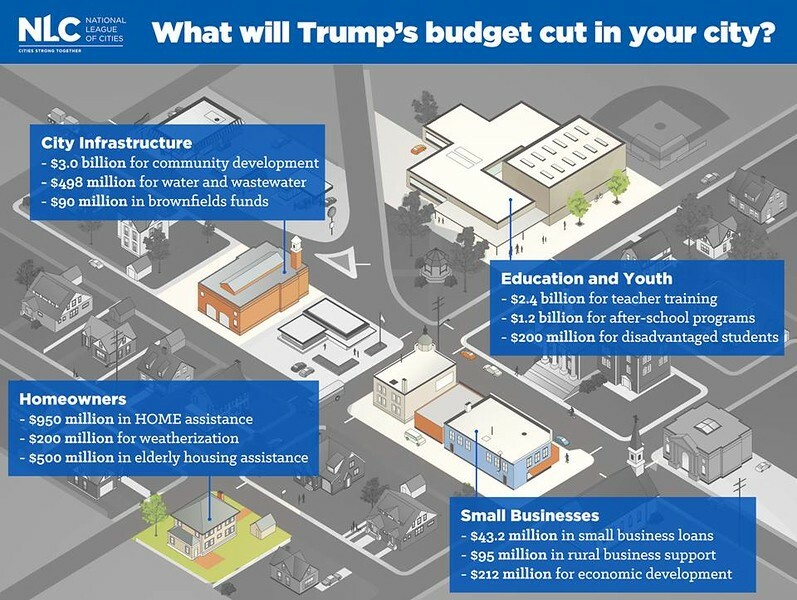 What Will Trump's Budget Cut In Your City? A look at what the President's proposed budget will mean for cities, and reaction from city leaders. “President Trump’s proposed budget threatens the safety and prosperity of cities across the country, and it betrays his campaign promise to lift up American communities both small and large. From Community Development Block Grants to Community-Oriented Policing Services, the programs targeted for cuts provide support for millions of working Americans and help cities invest in public-good projects like police stations, food banks and domestic violence shelters. These unprecedented cuts would be devastating to all our nation’s cities — with the worst impacts felt in small towns and rural communities. Graphic depicting how budget cuts will effect cities. Image Credit: National League of Cities. “Community Development Block Grant (CDBG) funds are the heart, lungs, and backbone of cities and counties, small, medium and large. By eliminating or cutting them, the Administration mortally wounds the places where the majority of Americans live, work and play. Such a move risks ending or harming programs that keep Americans safe, help them find better-paying jobs, improve their health and keep public facilities in good shape. It is an attack on places the President said he wanted to help. “On behalf of the elected officials of America’s cities and counties across this nation, we urgently request a meeting with HUD Secretary Ben Carson to discuss our utmost concern before any proposal is sent to Congress. “The federal budget proposal released today utterly fails to meet the needs of the nation’s communities. If the proposed cuts to essential community development, housing, and transportation programs are enacted, communities across the nation would face serious threats to economic growth and prosperity. At a time when cities and towns face significant challenges to infrastructure investment, affordable housing, and economic development, the elimination of critical and proven federal programs is damaging and unacceptable. The budget sent to Congress today would eliminate several critical programs at the Department of Housing and Urban Development, including Community Development Block Grants (CDBG), HOME, and Choice Neighborhoods. In addition, the budget would end support for New Starts transit funding, TIGER grants for key transportation projects, and the Economic Development Administration. These programs are the foundation of locally led efforts to build stronger, more just, and more prosperous communities. They not only have a proven track record of success and bipartisan support but also act as tools for leveraging private sector investments. The irresponsible cuts in this budget also make our communities more vulnerable and less safe with cuts to coastal mapping and resiliency efforts and the elimination of pre-disaster mitigation planning grants. Simply put, the scope of these cuts places jobs, development projects, and public health at risk. Further, the proposed changes threaten to undermine expressed priorities of President Trump, ranging from infrastructure investment to boosting growth and jobs. Planners stand ready to work with Congress and the Administration on policies and programs that will strengthen communities. This budget would take the country in the opposite direction. The elimination of federal programs that help communities plan and prosper will harm essential local housing, transportation, and economic development priorities. They will weaken job creation, hinder private sector growth and investment, and slow efforts to expand opportunity.